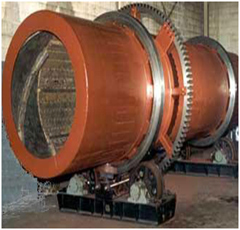 All rotary dryers have the feed materials passing through a rotating cylinder termed a drum. It is a cylindrical shell usually constructed from steel plates, slightly inclined, the material is introduced at the upper end move towards the lower / discharge end. Depending on the arrangement for the contact between the drying gas and the solids, a dryer may be classified as direct or indirect, con-current or counter-current. The drum is mounted to large steel rings, termed riding rings, or tires that are supported on fixed trunnion roller assemblies. The rotation is achieved by either a direct drive or chain drive, which require a girth gear or sprocket gear, respectively, on the drum. As the dryer rotates, solids are picked up by the flights, lifted for a certain distance around the drum and showered through the air in a cascading curtain. 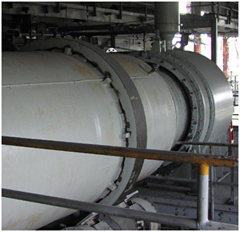 Most of the drying occurs at this time, as the solids are in close contact with the gas. Flight action is also partly responsible for the transport of solids through the drum. As a best practice, we highly recommend using the element whenever possible to ensure matching cross-browser rendering.